Retailers and the media were brought deep into the heart of Texas for the first Sportsman Country National Dealer Meeting. CEO Johnny Tai played host as the group saw the assembly lines, spare parts inventory and massive 325,000 sq.-ft. facility with their own eyes. Presentations by leading lenders like Wells Fargo, Sheffield and Roadrunner – plus a 10-year track record – confirm that everything is bigger in Texas. But this is only the beginning! Sportsman Country was formed as an umbrella for multiple brands, according to Tai. “In 2009 I set up Bennche, and my partner David Shan had founded Massimo Motor in 2008.” Despite being located mere miles apart, the two operations stayed at arm’s length for a few years. In fact, it took until 2016 for them to begin serious discussions about a joint venture. Linhai was the first brand to come under the umbrella, benefiting from PDI, quality control, distribution and everything else required to better reach the American market. In turn, Sportsman Country gained access to machines that were missing from Bennche and Massimo’s respective product mixes. Shan founded Massimo on a dream and three pillars: “Good Price, Good Quality and Good Service.” However Sportsman Country is taking it one step further with full warranties on everything. “In the past we used a third party to handle extended warranties, but there were some misunderstandings and unnecessary issues on the dealers’ side,” explains Tai. Not only was warranty work not being done nor the dealers getting properly reimbursed, but critical information wasn’t being relayed back to the manufacturer. “We started to implement our own software and we are able to track all the VIN information. We created our own in-house extended warranty called BEAST… our guys know the products, we know what’s going on and we can better assist the dealers and the consumers if there was a problem.” Bottom line: “We believe in our products enough to self-insure them,” says Tai confidently. “We fully assemble our products because we can do it more efficiently and consistently so we can save the dealer a lot of time. When the dealer unloads the product, it is ready to sell!” Not only does this ensure the units are up to snuff, the dealer keeps the PDI money as a little wiggle room. Sportsman Country also offers free freight for minimum orders, which means a bit more profit on every unit sold. Representatives from both the wholesale and retail institutions were on hand to update the couple dozen dealership personnel on the latest financial features, but the real fun was out behind the massive 325,000 sq.-ft. building (a former Sears catalog facility). 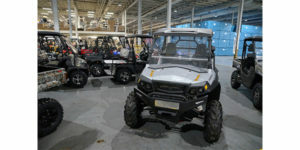 The test track gave dealers a chance to get some saddle time on the full array of ATVs and SxS vehicles from all three brands. We are just trying to figure out how to wrangle a couple long-term test units for the MPN team.